He has a mass growth that went from marble size to good ball size in a little over a year. Yesterday the mass erupted. Veterinarian's Assistant: I'll do all I can to help. Some lumps are serious and some aren't. Let's see what the Veterinarian has to say. What is the cat's name and age? Veterinarian's Assistant: Is there anything else the Veterinarian should be aware of about Kizer? Experience: Small animal veterinarian with a special interest in cats, happy to discuss any questions you have. Where is it on him? What came out when it erupted? Can you take a photo of this for me to assess? To post it, you can use the paper clip button on the tool bar above the text box (last icon). Or if you cannot see that, then post it on any site (ie Flickr, Photobucket, Imgr Instagram, etc) & paste the link here for me. Lovely, I will keep an eye out for that. Yes, just downloading them now. With this in mind, it good that its not attached to deeper structures but if he were my patient, I'd want this assessed via fine needle aspiration (FNA). This is where a vet uses a needle to harvest cells from the lump. If they remove pus, then this tells us that there is an abscess present and antibiotics can be dispensed. 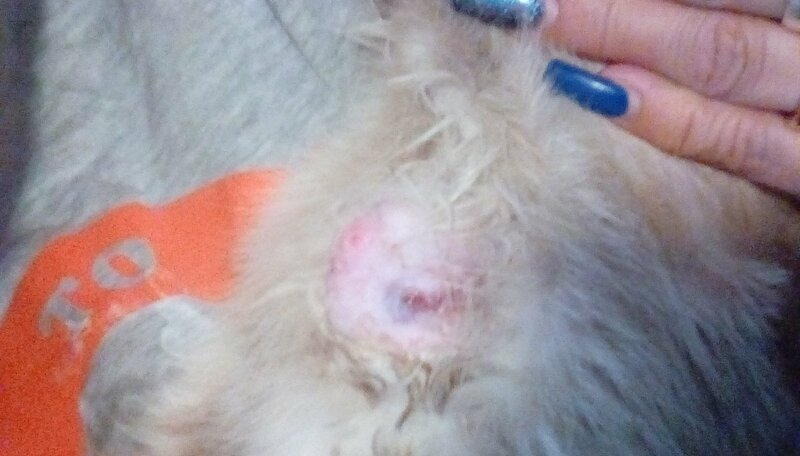 But given the time frame he has had this, that is a bit less likely and ideally we'd want the vet harvesting cells to stain and identify. That lets us determine what kind of mass this is and whether it is one we need off urgently. That said, as its growing to a point that the skin is becoming compromised, it really would be best off anyway. Though as he has some kidney compromise there on the bloods, it would be a bit tricky and we may need him on fluids through the surgery to just support them (though I'd note that the increased white blood cells may be related to this if there is an abscessed component to the mass). Any delay and we do need to start supportive care. Since its opened, we want to be cleaning this 2-3 times daily with a mild antiseptic (ie dilute betadine, chlorohexidine, or salt water). Afterwards, pat the area dry and apply an OTC antibiotic cream. To reduce inflammation to the rest of the lesion, if he will allow you can try gently warm compressing this lump. This can reduce inflammation as well as encourage hematomas and allergic reactions to settle. Just to note, you can make a safe warmer for use as a warm compress by filling a clean sock 2/3rds full with uncooked white rice. Tie it closed and microwave (approx 1-1.5 min). Before use, do make sure to shake to allow the heat to distribute before using as a compress. (If it cools, you can re-warm as required). But again this is worrisome because its ulcerating now and that tends to just get worse as it grows. So, we would want to have this tested to ID what is in there but we may need to have it removed to head off this worsening. Ok. Thank you doctor. I have been cleaning since yesterday. The puss that came out had a foul smell. The mass has since shrunk from golf ball size to just over marble sizeI intend to shave the hair around the around the area. Is that ok?What ointment is recommended? You are very welcome, my dear. I am glad to be of help & wish you both the best there. You can shave it but take care not to damage that skin as it will be fragile. 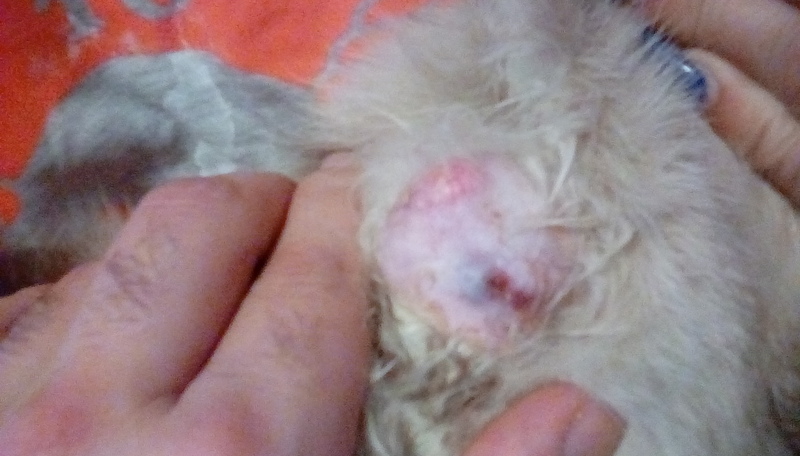 Though if you did get pus from it, that does suggest an abscess (hopefully only that and nothing underlying) but you can try to gently express as much as possible from it but we'd want antibiotics to see if we can get this settled. PS- OTC Neosporin is fine. Of course, use an ecollar if he tries to lick it off. It does depend on the bacteria present but often Amoxicillin with clavulanate is a good first line broad spectrum option.